I openly ask this question, because it’s kinda messed up to come into my inbox, talking about you’re thinking of me because of some stupid reason, and then giving this half-assed lie as to why you stopped talking to me before. The reason itself just made me roll my eyes as they darted across the small screen. He says to me “you mentioned Jeff and seemed so busy”. See, I have to call shenanigans on that for several reasons. 1-The entire time we were emailing each other, it was straight up a game of catch-up. It wasn’t like I was SO busy with my beau at the time that I wasn’t making time for this person. 2-It wasn’t even that serious. 3-When he stopped talking to me, I even emailed him and asked was everything okay. I never got a reply. I just let it go. Keep in mind he did the same thing like almost two years and some change ago. He suddenly stopped talking to me. When he explained THAT one, he says to me it sounded like I didn’t want to be bothered. At the time, I was sick in bed and I wasn’t even doing much. Between medicine, TV, and Mucinex-induced hallucinations, I had PLENTY of time. That’s why I’m calling it fake. I don’t know what’s going on in his head, but outside is a different story. And if you’re going to keep snubbing me, then making up excuses, it’s fine. Just like you said in the letter–“if you don’t want to talk, it’s cool”. You know you’re wrong. Or maybe not. It seemed like a good idea to email me at 4:30 AM because you were “thinking of me”. Just saying, it would have been different had I been respected and given an actual reason why I was suddenly snubbed those times. But hey, this is also the same person who felt it was right to let me figure things out for myself when he dumped me. What else did I expect? The past is the past for a reason, and at this point there’s no need to waste time or energy with the silly emails. When I wanted a clean slate, I offered it without pretense. Even when my then beau’s fur was ruffled, I was on this mission to make things right with someone I considered a friend. Let’s be honest here–what kind of “friend” steals your PSPs? What kind of “friend” shuts you out and presents their own truth as an excuse? Too old for this. Glad you’re breathing and hope you have a great life, but you are phony. I don’t need disrespect, and I don’t need phony crap. It’s been a rough 72 hours. But it’s that time of year when drastic weather changes hit me hard. I hate that. Everything is put on hold until I can get better. I’m privileged to have a situation where I can put things on hold, but at a great disadvantage at the same time. Until I get my weight back in check to a point where this isn’t an issue, cold weather and odd conditions are not my friends. I can have a flare-up for various reasons– poor air quality in the Summer, mold, chilly weather. I can feel it coming and I loathe every second. I loathe every cough, every hour of congestion and the….incontinence from a hard cough…ugh. I have it under natural control, but I need a doctor all up in my lungs. I have to wait until October to see that part through. Yesterday, I started to think of my ex, Darren, and how this crap used to effect his entire…everything. He lost jobs because of it. He lost my favor because of it. I felt so bad about that after having to deal with it myself. It just showed up two years ago after not bothering me for soooo long. I mean…he and I were doomed anyway but I started to realize what it was like to be sick, bedridden, and pretty much unable to move around without the world barking at you. In any case, I still got up to do my daily chanting. I was proud of myself for that. I need to do better with evening chants, but I’m usually right on time for the morning chants. I just keep chanting Nam-Myoho-Renge-Kyo, looking forward to the victory of a healthy body and being able to work out again and being able to get up and do things again. 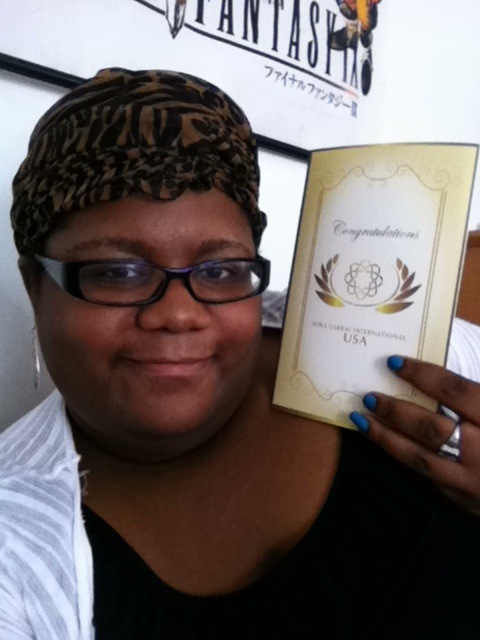 So I received my Gohonzon Sept. 8th. It will be enshrined sometime this week or weekend. I have about two more pictures from the event, but will have to ask my neighbor for those. I also finally had a chance to record the poem that moved everyone at the SGI meeting where I pretty much put it all on the line–I explained why I kept coming to the meetings. It was a hard poem to write, but it was one that needed to be out of my system. So, here it is. I also wanted to ask anyone who visits this blog to also visit my main blog. It’s a product-review ish type blog and I need all the exposure I can get. If you see some ads, support this broke writer and click a few. Support me a lil more and subscribe if you like my wacky writing style! For video of this strange lady reciting poetry, I also have a YouTube channel called Peridot Lyrics. Give it a visit!